Basic Theory Test for all new drivers! 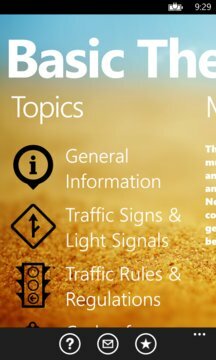 The best and most comprehensive FREE Basic Theory Test in the Windows Phone Marketplace! 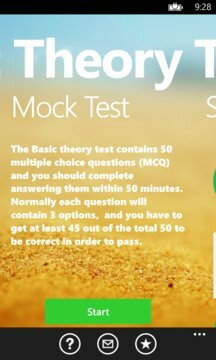 The Basic theory test contains 50 multiple choice questions (MCQ) and you should complete answering them within 50 minutes. Normally each question will contain 3 options, and you have to get at least 45 out of the total 50 to be correct in order to pass. In the Basic Theory Test Windows Phone application, there are nearly 300 questions. You can learn and review questions by topics. All questions come together with answers. You will be alerted with correct answers should choose any wrong answers during the practising stage. Summary results and detailed results are presented after each test.